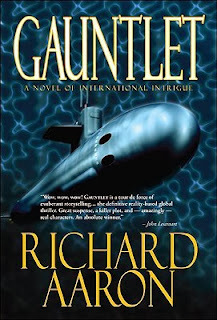 Despite an early plot hole that nearly derailed my reading (neither a significant amount of stolen Semtex nor the murdered soldiers responsible for its transport are missed) and some inaccuracies in the story (for instance, the TTIC has been known as the NCTC since 2004), Gauntlet was a solid, enjoyable read that deserves a place upon the techno-thriller shelf. It probably leans more towards the Michael Crichton side of the shelf than the Tom Clancy side, with the focus more on the technology than the tactics, but Richard Aaron has clearly spent a lot of time thinking through the ramifications of a terror strike. More importantly, he's also invested heavily in the characters on both sides of the struggle. This is a book of immense scope, with a large cast of characters, and various subplots crossing one another. The reader almost needs a scorecard at times, just to keep things straight, but Aaron does a good job of making the characters easily identifiable, and instantly memorable. For instance, Turbee (the eccentric/Autistic math geek) is a fun character, very much a social outsider, but precisely the kind of guy you're glad isn't on the other. CIA Agent Richard Lawrence is another strong character, somebody I could very well see fitting into a show like NCIS, while I found the portrayal of Inspector Inderjit Singh as a solid, serious, dependable representative of the RCMP to be very refreshing. This is also a novel is that is truly international, as demonstrated by its cast. All too often the genre seems to be about American chest-thumping, with little regard for the other players, but the rest of the world does have a part to play here. Even the terrorists are portrayed as characters to whom we can relate, as opposed to just cartoon/stock villains. There is no doubt that Youseff is a threat to the United States, but you can see how some might consider him to be a hero for the cause. One word of caution - after a blistering final hundred or so pages that really drive the story to a climax, we're very much left hanging. It really just stops, leaving the bulk of the story to be explored in subsequent volumes. If you're a reader who likes a self-contained story, then that may be a concern, especially with the wait for a sequel now approaching 4 years. However, Counterplay is due to be released sometime this Fall, so now is a great time to become invested in the story of Gauntlet.